A team of astronomers has conducted ALMA's first large-scale, high-resolution survey of protoplanetary disks, the belts of dust and gas around young stars. Astronomers have cataloged nearly 4,000 exoplanets in orbit around distant stars. Though the discovery of these newfound worlds has taught us much, there is still a great deal we do not know about the birth of planets and the precise cosmic recipes that spawn the wide array of planetary bodies we have already uncovered, including so-called hot Jupiters, massive rocky worlds, icy dwarf planets, and -- hopefully someday soon -- distant analogs of Earth. To help answer these and other intriguing questions, a team of astronomers has conducted ALMA's first large-scale, high-resolution survey of protoplanetary disks, the belts of dust and gas around young stars. 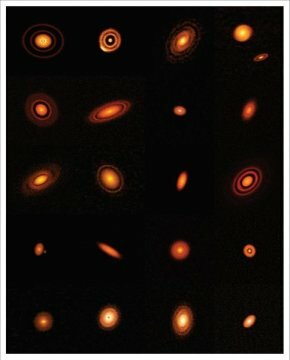 Known as the Disk Substructures at High Angular Resolution Project (DSHARP), this "Large Program" of the Atacama Large Millimeter/submillimeter Array (ALMA) has yielded stunning, high-resolution images of 20 nearby protoplanetary disks and given astronomers new insights into the variety of features they contain and the speed with which planets can emerge. The results of this survey will appear in a special focus issue of the Astrophysical Journal Letters. According to the researchers, the most compelling interpretation of these observations is that large planets, likely similar in size and composition to Neptune or Saturn, form quickly, much faster than current theory would allow. Such planets also tend to form in the outer reaches of their solar systems at tremendous distances from their host stars. Such precocious formation could also help explain how rocky, Earth-size worlds are able to evolve and grow, surviving their presumed self-destructive adolescence. "The goal of this months-long observing campaign was to search for structural commonalities and differences in protoplanetary disks. ALMA's remarkably sharp vision has revealed previously unseen structures and unexpectedly complex patterns," said Sean Andrews, an astronomer at the Harvard-Smithsonian Center for Astrophysics (CfA) and a leader of the ALMA observing campaign, along with Andrea Isella of Rice University, Laura Pérez of the University of Chile, and Cornelis Dullemond of Heidelberg University. "We are seeing distinct details around a wide assortment of young stars of various masses. The most compelling interpretation of these highly diverse, small-scale features is that there are unseen planets interacting with the disk material." The leading models for planet formation hold that planets are born by the gradual accumulation of dust and gas inside a protoplanetary disk, beginning with grains of icy dust that coalesce to form larger and larger rocks, until asteroids, planetesimals, and planets emerge. This hierarchical process should take many millions of years to unfold, suggesting that its impact on protoplanetary disks would be most prevalent in older, more mature systems. Mounting evidence, however, indicates that is not always the case. ALMA's early observations of young protoplanetary disks, some only about one million years old, reveal surprisingly well-defined structures, including prominent rings and gaps, which appear to be the hallmarks of planets. Astronomers were initially cautious to ascribe these features to the actions of planets since other natural process could be at play. "It was surprising to see possible signatures of planet formation in the very first high-resolution images of young disks. It was important to find out whether these were anomalies or if those signatures were common in disks," said Jane Huang, a graduate student at CfA and a member of the research team. Since the initial sample of disks that astronomers could study was so small, however, it was impossible to draw any overarching conclusions. It could have been that astronomers were observing atypical systems. More observations on a variety of protoplanetary disks were needed to determine the most likely causes of the features they were seeing. The DSHARP campaign was designed to do precisely that by studying the relatively small-scale distribution of dust particles around 20 nearby protoplanetary disks. These dust particles naturally glow in millimeter-wavelength light, enabling ALMA to precisely map the density distribution of small, solid particles around young stars. Depending on the star's distance from Earth, ALMA was able to distinguish features as small as a few Astronomical Units. (An Astronomical Unit is the average distance of the Earth to the Sun -- about 150 million kilometers, which is a useful scale for measuring distances on the scale of star systems). Using these observations, the researchers were able to image an entire population of nearby protoplanetary disks and study their AU-scale features. The researchers found that many substructures -- concentric gaps, narrow rings -- are common to nearly all the disks, while large-scale spiral patterns and arc-like features are also present in some of the cases. Also, the disks and gaps are present at a wide range of distances from their host stars, from a few AU to more than 100 AU, which is more than three times the distance of Neptune from our Sun. These features, which could be the imprint of large planets, may explain how rocky Earth-size planets are able to form and grow. For decades, astronomers have puzzled over a major hurdle in planet-formation theory: Once dusty bodies grow to a certain size -- about one centimeter in diameter -- the dynamics of a smooth protoplanetary disk would induce them to fall in on their host star, never acquiring the mass necessary to form planets like Mars, Venus, and Earth.